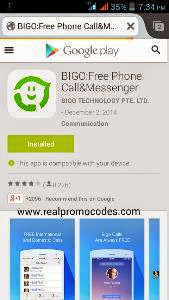 We are presenting another app ‘Bigo’ this app also offers you absolutely free calling Minutes every month without spending a single penny,you can call worldwide freely the call rates are different for different countries. After downloading open the app and browse through,you can call other person freely even if Bigo is not installed on their phone and they don’t have internet connection. In addition to all this you can also increase your credits by simply referring your friends to this app you earn 20 Credits per referral,and these credits are carried forward to next month if left unused.